Business Flyers is rated 4.7 out of 5 by 56. Rated 5 out of 5 by LovePineDesigns from Great quality and prices! I’ve used 48hourprint on several occasions for several projects. The quality and prices are GREAT! Rated 5 out of 5 by BlueCircle from New flyers Excellent work! Great true color printing! Will use the brochure for all new clients..
Get your message out with high-quality, affordable business flyer printing. Custom business flyers are a tried-and-tested advertising tool that let you target specific audiences without spending a lot of money. Hand out flyers outside your store or display them as reading material in your lounge or reception area. You could also give them away at large events such as conventions and weekend markets. Either way, business flyers shift the customer’s focus to your brand’s new product, offered discount deal or big company announcement. We print business flyers on 100 lb. text paper. It is also referred to as book weight or text weight paper and is the thickest standard paper stock. It still maintains the flexibility of standard copy paper with a weight thinner than cardstock. This makes folding 100 lb. paper faster and easier for the transport and storage of bulk flyer orders. The substantial weight and feel of 100 lb. paper allows for matte, gloss, and high gloss UV coating on both sides of your business flyer design. Our three coating options highlight your company’s big announcement or promo in distinct ways. Matte provides a smooth surface and sophisticated touch to your colors. Lengthier text, graphics, and images are easy to read. The surface is writable but still provides protection from scratches. Perfect for real estate flyers handed out an open house. Gloss makes every color pop and adds an extra shine to the flyer surface. Highly recommended for business flyers with image heavy designs. Gloss is also fingerprint, ink, and scuff-resistant. High gloss UV gives a higher shine than gloss and adds more depth to the printed colors. The coating is also abrasion, chemical, and moisture-resistant. Ideal for flyer distribution that will be handled multiple times or in high traffic, outdoor areas, letting more customers know about your big sale or restaurant opening. 4.25” x 5.5” is a handy, small size that’s easy to give away and convenient for customers to keep for further reading. 6” x 9” flyers are slightly smaller than the standard letter size but provide enough space for large images and blocks of text. 8.5” x 11” is the standard letter size (think copy paper) and a common choice for business flyers. 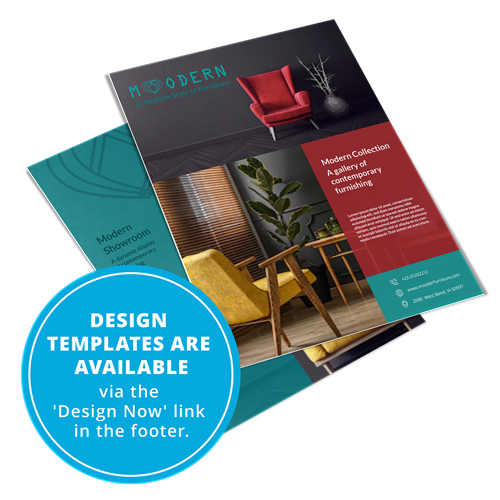 You can also try our flyer templates or design your flyer online to help get you started. 48HourPrint.com also offers 24-hour customer support and free proofing to help make your business flyer printing experience as smooth as possible. How long will it take to print and process my business flyers? We print flyers in just 48 hours or two business days. This 2-day period is referred to as the printing turnaround time, which does not include shipping transit time, weekends, and holidays. This time begins once you have paid for your order and approved the proof. What is the advantage of using 100 lb. text paper? 100 lb. text paper is thicker than your standard copy paper. This makes it more durable but it does not compromise the lightweight flexibility that copy paper is known for. What if I want to create a custom business flyer? If your preferred size is not available on our online calculator, you can request a custom quote here. What is the advantage of adding shrink wrapping to my order? Shrink wrapping is the process of wrapping each flyer with clear plastic to protect it from damage during shipping. We highly recommend this option for both small and large quantity orders. You only pay a small additional cost to ensure every flyer is neat and presentable for distribution.